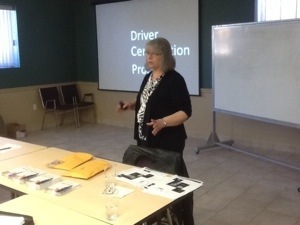 Ministry of Transportation Training and Development Analyst presented to the Hamilton Niagara Chapter of the Fleet Safety Council today about the importance of creating a meaningful curriculum for professional drivers in a training system. The group used modelling profiles to assess training modules for students learning to become professional drivers. Thank you Mary Jane for an awesome presentation with great information. Next month Rick Gladman of Old Republic Insurance will discuss how to handle issues when incidents happen within your fleet. Previous PostPolice State of Mind event is a big hit!Next PostIt’s Not My Fault,or is it?